Replied by ziggy2 on topic yellow lab or hybrid or something else? Don't breed that fish if it's a hybrid. Replied by PedrOscar on topic yellow lab or hybrid or something else? 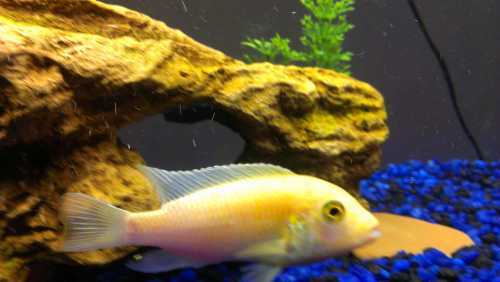 I put a red zebra in there with this yellow one & yellow went wild ,dancing in front of red zebra and vibrating, red zebra had many egg spots yellow one only has one egg spot, but the red zebra was in responsive just went about normal fish business and then soon the yellow one treated the red zebra as another fish to chase away so much that Red Zebra had to hide behind heater so I traded him back to LPS. 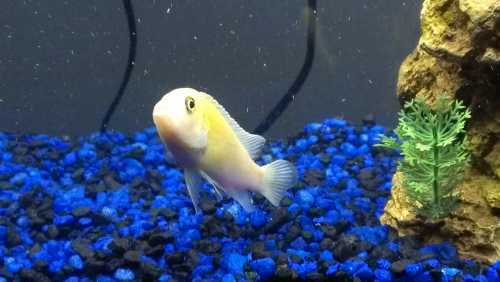 I have in the 55 gal with yellow, a littler than yellow one, blue colbalt zebra, and it don't get the chase that the, bigger than yellow one, red zebra did. I don't get it. 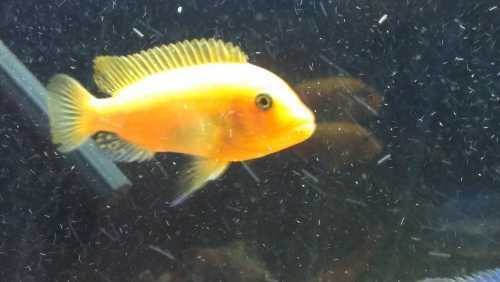 It would nice to find a mate for yellow mbuna because it seems to be wanting to to only that...lol. thanks for your input . Replied by dragonkeeper on topic yellow lab or hybrid or something else? Looks to me like a hybrid variant of the red zebra. Trying to identify this yellow one since day one, help!